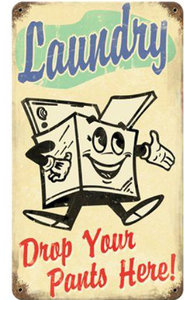 NO returns are allowed for "used or laundered" products. If you use or launder it, it is now yours to enjoy. Look over the towels you received from the RagLady and make certain they'll meet your needs. If you want to do a test launder, use only ONE towel, not the entire pack. Cotton shrinks. It's a fact of life. Just like your favorite jeans and t-shirts, cotton towels and rags will shrink in the laundry. Just like teenagers, cotton shrinkage can't be uniformly controlled. After laundering, you might find that it shrinks more on one side than another. We call that character. Wash and dry new towels BEFORE first use to make them more absorbent. Keep in mind that colored towels, because of chemical penetration into the fiber, are less absorbent than white towels. Towels will become more absorbent with each washing. Towels get better with age! Put all terry type towels in a dryer before their first use! Nothing will "bang" more lint out of the towels than a few good spin cycles in the dryer. Do not wash terry towels with non-terry towels. Terry towels are linty—nature of the beast. Remember to clean dryer lint trap before and after each drying cycle. Wash and dry new towels to make them fluff and feel nicer. Some towel types are stored compressed and feel stiff or look flattened when first received. Do NOT use bleach. (Okay, you can use bleach but please keep in mind bleach is the kiss of death to everything.) Over time, using harsh chemicals such as those contained in bleach and fabric softeners, reduce the quality, effectiveness and longevity of the material. Use hydrogen peroxide as a disinfectant. When choosing store-bought whiteners, look for products marked "non-chlorine bleach" which means they're made with either hydrogen peroxide or sodium percarbonate. Several of the "green" liquid oxygen bleaches are mainly hydrogen peroxide. Do not use fabric softener or dryer sheets. Laundering with fabric softener will make the towels feel soft. Fabric softener however is essentially a wax-like coating that surrounds the towel. The wax-like coating will repel water not allowing towels to absorb like they should. This coating also prevents towels from breathing properly, trapping in mildew odors. Wash color towels separately. Wash with like colors. Color towels will bleed. Never wash white towels with colors. Wash towels in cold water with one cup of white vinegar and 1/2 cup of detergent. This will help release lint and set colors. Tumble dry low. Less shrinkage, wear and tear. 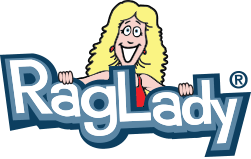 The RagLady has the best towels money can buy!